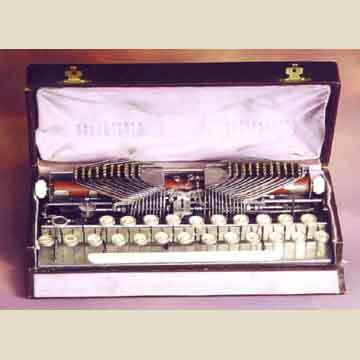 These are pictures of the only Fontana Baby typewriter known to exist. When it was found in a Milan flea market in 1999, nobody had ever heard of its existence. There are no references to this machine anywhere. No trade catalogs, not ads, nothing. It may have been a remarkable prototype that never went into production. The Fontana company produced a middle-of-the-road typewriter between 1922 and 1925, so it is likely that this baby model was developed sometime during that period. The Fontana Baby is a very small machine measuring 26 x 9.5 x 7 cms and weighing only 1.3 kg. It has only 21 keys with a triple shift system, so it produces a total of 84 characters. The 21 keys are arranged on a two-bank keyboard with the shift keys on the side. What is very surprising about this machine is that it is the only typewriter that works with the same kind of inverted U-shaped typebars that the Oliver typewriter was famous for. But where the Oliver bars are vertical and strike down, the typebars of the Fontana Baby swing a full 180 degrees. Note that the number of typebars is uneven: there are ten on the left and eleven on the right. Current ownership of the Fontana Baby is unknown.